﻿ Chasing Mavericks - Surfer Jay Moriarity » True. Sports. Movies. Mavericks is the name of a surfing location in northern California just north of the town of Half Moon Bay, 20 minutes south of San Francisco and 1/2 mile offshore from Pillar Point Harbor. Due to the geological makeup of the sea floor, this particular location can generate waves that typically crest at over 25 feet, and top out at over 60 feet, after a strong winter storm from the northern Pacific Ocean. For contrast, most surfing waves are 6-feet high or less. For many years, Mavericks received very little notariety as a destination for big wave surfers because (1) the gigantic waves were thought to be mythical (popular opinion was that there simply were no large waves in California); and (2) the location was deemed too dangerous to surf. Jeff Clark, a surfer that grew up in Half Moon Bay, was the first documented person to have surfed Mavericks, in 1975 at age 17. He studied the wave patterns and learned how to navigate it. For the next 15 years, Clark surfed Mavericks as his own playground. 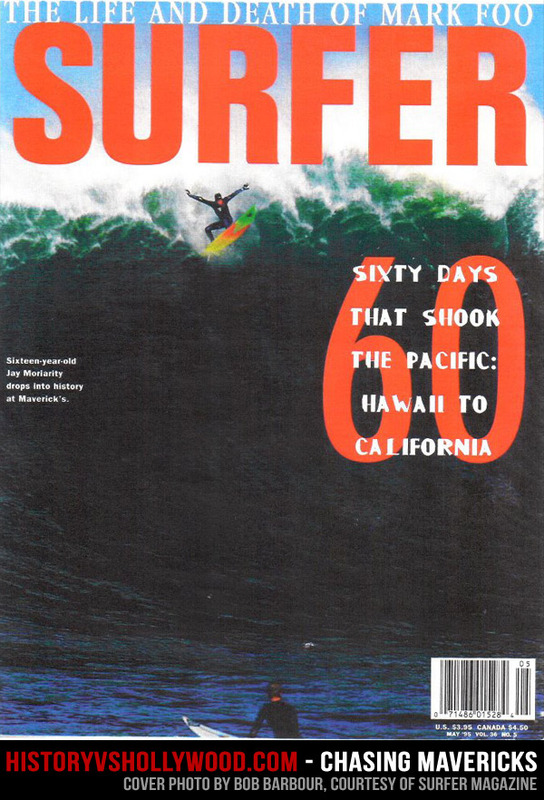 It wasn’t until 1990 that Clark was able to convince Santa Cruz surfers David Schmidt and Tom Powers to surf Mavericks with him and almost instantly, word got out Maverick’s waves rivaled that of Waimea. The movie, Chasing Mavericks, is based on the true story of Jay Moriarity, another Santa Cruz surfer, and his quest to surf the legendary waves. With the guidance of his surf mentor, Frosty Hesson, Jay learns to surf Mavericks at the age of 15. As a 16-year old, Jay became internationally famous when his “iron cross” wipeout, in which he dropped 35 feet from the lip of a Maverick’s wave, was caught on film landed the cover of Surfer magazine. This spectacular wipeout has been identified as one of the top 30 groundbreaking moments in surf history but more importantly, it gave legitimacy to Mavericks as a big wave surfing destination. Photographer Frank Quirarte has captured some amazing surfing and waves at Mavericks that illustrates how massive these waves are; here are a few and here is a link to his portfolio that includes many more. In the movie, Jay tells his girlfriend that Mavericks has “the biggest wave in the world.” While the waves at Mavericks can regularly reach 25 to 60 feet when winter conditions are right, there have been other locations with higher waves recorded. Garrett McNamara holds the official world record when he was towed-in (ie, pulled by a jetski) to ride a 78-foot wave at Nazare, Portugal. Shawn Dollar holds the record for paddle-in surfing when he caught a 61 footer 100 miles off the coast of San Diego, CA. The scene in which Jay leaps off the cliff with his board into the water happened at Steamer Lane in Santa Cruz, not at Mavericks. In fact, many surfers there do choose to leap off the cliff as their route into the water. The surf at Mavericks is rugged and ragged at the cliffs, making it unsafe to jump in. Surfers use extreme precautions to paddle out to the break, taking a minimum of 20 minutes even when conditions are at their very best. In the movie, Frosty saves Jay from drowning when Jay tries to save a dog, and this is how the two meet. In reality, the two met when Jay was 12 through another surfing instructor working with Jay. In the movie, Jay asks Frosty to train him to ride Mavericks and when Frosty finally agrees, he tells Jay that they only have a window of 12 weeks to learn how to surf Mavericks. In reality, Jay did ask Frosty to help him train for Mavericks (at age 14), but the training took over a year and a half before Jay rode Mavericks for the first time. Jay’s colossal wipeout at Mavericks did occur, and is one of the most well-known surfing wipeouts ever recorded. It helped make Mavericks a legitimate big surf destination. Unlike the movie, however, Jay was under water for less than 30 seconds (not over 3 minutes as in the movie). Furthermore, the wipeout wasn’t on Jay’s first attempt at riding Mavericks, as shown in the movie. Jay had ridden Mavericks 8 months earlier when Frosty felt the conditions were right. And according to an interview with Frosty, Jay spent a joyous day riding the giant waves his first time at Mavericks, impressing many of the more experienced surfers. Jay Moriarity did die while free-diving in the Maldives. According to “Discovering Mavericks”, a search party was dispatched when he didn’t show up for dinner. They found his clothes and towel on the beach, then went underwater and found him at the bottom. It’s believed that he was practicing holding his breath for an extended amount of time when the accident occurred. In the movie, Jay’s memorial in the water happened as it did in real life. Those who attended the original memorial as well as for the filming of that scene described feeling the same emotions both times and said that it felt just as real. Here’s a footage of the actual memorial. Jay Moriarity died at age 22, the day before his 23rd birthday while diving in the Maldives. Prior to his death, he co-authored a book in 2001 called The Ultimate Guide to Surfing with his good friend Chris Gallagher. In addition to the movie Chasing Mavericks, the book, Surfing Mavericks: The Unofficial Biography of Jay Moriarity, was written about his life. A year after his death, his wife, Kim Moriarity, created the Jay Moriarity Foundation, which was established in 2001 to support worthy causes that directly benefit the environment, children and inspire everyone to “Live Like Jay”, a phrase often used in events honoring Jay or affiliated with his foundation and to inspire people to live life with the same positive attitude he had. Richard “Frosty” Hesson continues to surf the California Central Coast and still teaches kids about surfing and about life. He wrote a book called Making Mavericks in 2012 which talks about his life, his friendship with Jay Moriarity and how to be the best in the water and in life. In 2013, his wife, Robin “Zeuf” Hesson, passed away after a 20-year battle with cancer. Here is an interview he did in 2014 with updates on his whereabouts.